The usual distinction between dust devils and tornadoes is blurred by the size of monstrous whirlwinds on the planet Mars. Electric discharge offers the simplest and most direct explanation for the astonishing power of the Martian dust columns. Meteorologists believe that the atmospheric forces generating dust devils and tornadoes have little in common despite their similar appearance. Tornadoes do not occur in dry clear air, while dust devils do. The meteorological conditions in which the two arise are easily distinguished. But the “Electric Universe” allows for a unified perspective on both phenomena, with direct implications for our understanding of the Mt. Everest-sized dust devils on Mars. The most telling clue comes from the fact that both dust devils and tornadoes exhibit strong electric fields. 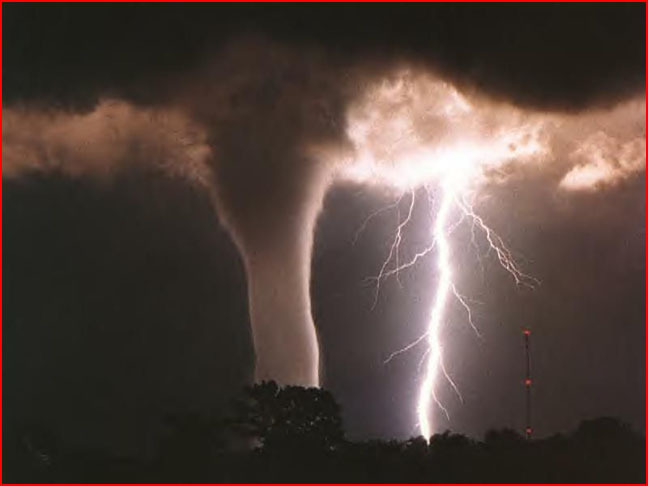 For the electrical theorists both events have counterparts in other meteorological marvels as well—lightning (including blue jets, red sprites, and elves), hurricanes, waterspouts, and auroras. All such phenomena can now be understood in terms of electrical discharge between the Earth and electrified space. In size and strength the “dust devils” on Mars dwarf tornadoes on earth. They achieve a diameter five times that of tornadoes, and tower five miles above the Martian surface. Meteorologists call them “dust devils”, not tornadoes, because they are not associated with water-laden storm clouds, which do not exist on Mars. Could chaotic “interference” of rising air pockets create the power of dust devils? One way to answer the question is to consider their cousins, water spouts. Here, the first visible effects are seen not in the air, but in the water below, and these effects are certainly not a result of colliding air pockets above. First a circular white spot appears, surrounded by an irregular dark area on the water's surface. Next a pattern of light and dark bands spiral outwards. Then a dense, swirling ring of spray, called a cascade, appears around the dark spot and rises toward the clouds. All of this relates to issues of charge separation. The electrical theorists insist that the greatest mistake by meteorologists is to follow the cosmologists’ notion of an electrically neutral and disconnected universe. By accepting this unsupported assumption meteorologists are required to mechanically separate charge wherever they see electrical activity. A flood of discoveries has disproved the assumption in recent years. Yet it still stands in the way of understanding the origin of lightning on Earth and the associated strange phenomena found stretching up toward space. Our Earth is connected to the circuitry of the Sun. The Sun is similarly connected to the currents flowing along the arm of our Milky Way. In the same way, electrified dust devils on Mars are inseparable from planet-wide circuits. These circuits, in turn, connect Mars to the electric system of the Sun. Mars has no storm clouds to distribute and to lower charge to the surface. The result is that huge, diffuse discharges take place directly between the ionosphere and the surface. It is these discharges that form the towering dust devils on Mars and are responsible for the enigmatic global dust storms seen on that planet from time to time. The naked electric force is1039 times more powerful than gravity. In its various manifestations it holds the universe together. It creates galactic structure, forms and lights the stars, and drives the formation of planetary systems. Electric fields not only pervade the macrocosm, they are active throughout our solar system. And on Earth charge separation is not an effect of the movement of air or water—it exists already and is a primary cause of movement. At the most basic level, electric currents are the prime cause of rotational movement in the universe. We live in a connected, electrically animated universe. And Nature does not ignore the utility of the electric motor!